Oops! I missed Black Friday. I was busy recovering from Thanksgiving and just couldn’t drag myself out of the house. That’s not quite true. I could have dragged myself out of the house and into the car, but I wasn’t sure where I’d go where people weren’t snarling over consumer goods and parking places. Now, I’ve missed Cyber Monday. I’m probably missing some significant sales today, too. The pressure is just horrendous for me to consume irrelevant stuff this time of year, but I will not succumb. I don’t really need to, since my shopping list is blessedly short, but I find Christmas shopping a very dangerous opportunity to over-spend — mainly on me! Not one word of that description tells me anything. It appears that in order to play this game, you have to spend a minimum of $8.99 (plus $6.95 shipping if you don’t either pick it up in the store or qualify for free shipping by buying another $41.01 worth of stuff, plus sales tax) to learn how to play the game and then buy the game itself. Nope. No way. Then, there’s this little gem in the tights with her fanny hanging below her jacket. Of course, what else but a hunk of molded polyvinylchloride could wear that outfit? The puppies are cute, but “Pickup only”? Yeah, kinda looks that way to me. Maybe if she put on some pants, she could get a real job. And they said Barbie was a tramp. Where are Raggedy Ann and Andy with their soft bodies and embroidered hearts? Where are the Lincoln Logs? Doesn’t anyone want an electric train set? Chinese Checkers? The other day, someone, obviously as old as I, asked what happened to Colorforms. When I was a kid, they came in exciting shapes, like Batman and Star Trek and Barbie, and you put them into comic book-like scenes. I bought the only set that I could find for The Daughter. 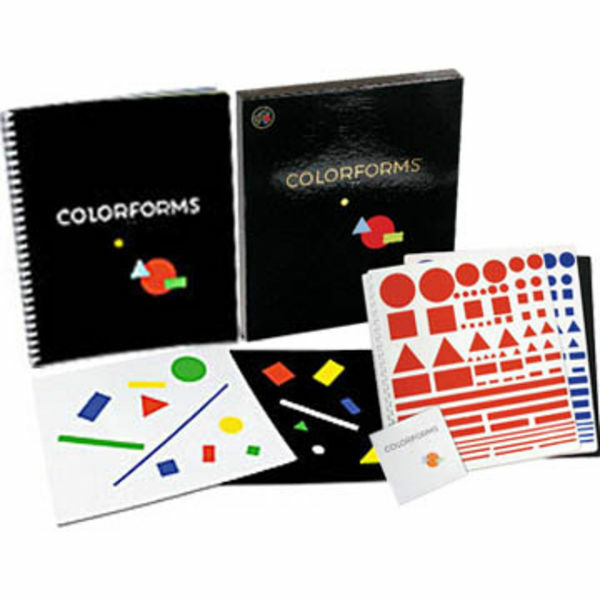 It was a huge set of basic shapes and colors organized in pages in a spiral notebook, and it was Very Expensive, sold through the catalog of the Metropolitan Museum of Art. My 10-year old self was in heaven. Hers was nonplussed. “Like, what do you do with these?” she asked. “I never understood the appeal of Colorforms, either,” The Veterinarian had the audacity to chime in. “OK, fine,” I snapped, “they’ll just be mine, and I’ll lull myself to sleep with the boring Colorforms.” I haven’t seen them since and couldn’t tell you what happened to them. I wish I could. They’re asking $25 on eBay for a well-worn, incomplete set or $75 at Amazon.com for a new set. The answer to that one still is, invariably, “No.” I’m not real fond of rhinestones, spandex, and bare midriffs in children’s clothing, unless they’re meant for the stage or the swimming pool. Don’t like them on most adults, either, for that matter. My shopping email inbox received 109 emails from Saturday to Monday evening. I let them pile up so I could count them. Most of them were from clothing stores, which is the most dangerous place of all to cyber-shop, but it’s also the most fun. I choose the clothes (mostly for myself), put them in the “shopping cart” or “bag”, and go on to the next site. I haven’t really purchased anything, but, somehow, my urge to acquire is satisfied. I used to play this same game with catalogs, but cyber-window shopping is much more satisfying. I looked up to see the women’s Chanel counter manned (in every sense of the word) by a cute young guy in a — get this — suit and tie — catnip to a woman over the age of 20. I kept walking but looked around to see who he was talking to. There was no one else. He made eye contact. At least, I think he did. I was distracted by the dimples. Thank God, I had just washed my hair and was wearing make-up to have my passport photo taken. I assume he was confused because I’m short, like a teenager, and, I thought, not unattractive in my gray tights, my black suede Uggs, and, unlike the little plastic dog-walking floozy, my puffy jacket was covering my considerable fanny. Did I want to be spritzed by a handsome guy with bad eyesight selling women’s perfume? Oh, you bet I did! But, I refrained. I am just not delusional enough to smell like a cougar. I kept moving and smiled breezily like that model in the old “Charlie” perfume commercial (google it). “I am now!” I replied to his question. He laughed. It’s always a good day when a 63-year old woman can make a young man laugh with her, not at her, so, who am I to complain? Life is good (mostly). Soli Deo Gloria! Categories: Christmas, Holidays, Humor | Permalink.